Could it be the reunion we've all been waiting for?! The Spice Girls have confirmed they are planning to reunite to work on some "incredible new opportunities" after the quintet were photographed together on Friday for the first time in six years. 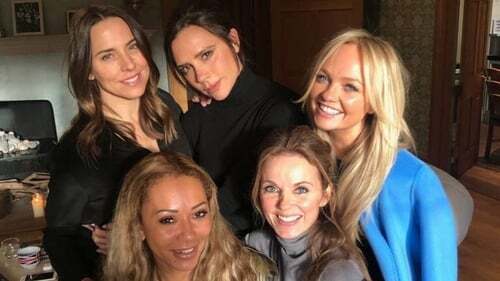 The news comes after Victoria Beckham, Geri Horner, Emma Bunton, Melanie Brown and Melanie Chisholm reunited at Horner's house in Hertfordshire, leading to a frenzy of speculation online that they were going to be working together again. A statement from publicist Jo Milloy on behalf of the group said: "We have enjoyed a wonderful afternoon catching-up and reminiscing about the amazing times we have spent together. Victoria Beckham, Emma Bunton and Geri Horner all shared the photo of them smiling happily together on Instagram, with Beckham saying: "Love my girls!!! So many kisses!!! X Exciting x #friendshipneverends #girlpower"
Bunton wrote alongside the photo "great to catch up with my girls" and added tantalizingly "the future is looking spicy!" while Horner said "Lovely seeing the girls #girlpower is alive and well"
This is the first time the famous quintet have been photographed together since 2012. The band's former manager Simon Fuller was also in attendance at the mystery meeting at Horner's home. Beckham posted a second photo of the Spice girls along with Fuller with the caption: "Love u all so much!!! X Such a great day!! Thank u Simon! X VB"
The very promising meeting comes after The Sun reported that they are set to reunite and are considering a number of different projects. The British newspaper reports that fashion designer Beckham will not sing if they reunite. A source told The Sun: "This is the pop reunion no one thought would ever happen again. "But after a long period of negotiation Victoria agreed the time is right to work on new projects this year. "It's very exciting because she has always been adamant she wouldn't go back." Here's hoping the highly-anticipated Spice Girls reunion happens this year! The Spice Girls became a worldwide phenomenon after blasting onto the music scene with their smash-hit Wannabe in 1996. They split in 2000, before later reuniting for a tour in 2008 to tie in with a greatest hits release and to act as a farewell to fans. The band got together once more to perform at the Olympic closing ceremony in 2012. They had been expected to reunite for their twentieth anniversary in 2016, but it failed to materialise. As expected, fans have been welcoming the thought of a Spice Girls reunion with open arms.